Writing on Wednesday: Who Needs Periods Anyway? Before you cringe, this isn’t about those periods, guys. It’s about the kind you put at the end of a sentence. Whew—glad we don’t have to whisper. The first editor I worked with on the novel I’m (still) revising advised me to chop my long sentences up into shorter, more precise ones. She said the plot would move along better that way. I took her advice, but I’m not sure I’m pleased with the results (of that specific instruction) and I’ve found myself putting back in some of those longer sentences as I continue to revise. Why? Because that’s what we do here in the South. And the folks I hope to attract to my book aren’t the kind of readers who fly through a story, hurrying to get to the next scene. They’re the kind who like to sit on the front porch with a cold drink in the summer, or snuggle up by the fire with hot chocolate in the winter, and meander through the lives of the characters and the descriptions of the landscape of the story. Sure, I get tired of Hemingway’s prose at times. And I’ve been guilty of cruising through an extensive paragraph of literature if it lingers too long on the color of the grass. But sometimes it’s nice to play with the sentence and see how long you can sustain its momentum. Frances Mayes did just that in her essay in the Spring 2015 issue of The Oxford American. 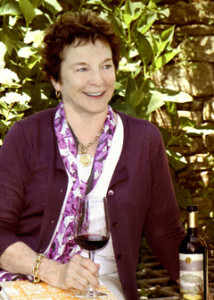 Her short article, “Frankye’s Cookbooks,” is a snapshot of her mother’s kitchen and culinary world seen through the eyes of a child growing up in South Georgia. It’s full of mouth-watering descriptions of foods—before and after cooking—vivid images of the characters who peopled her kitchen, her family, and her town, and a strong sense of place. Everything one might expect from good literary writing. The only thing that’s missing is periods. There aren’t any. Not a single dot at the end of any line. Well, until you get to the end of the essay. No paragraph indentions either. Just a stream-of-consciousness that flows from a seasoned (this is not for amateurs) writer’s pen straight into the heart of the reader. … pulling everything out far into the deceptive calm of memory, whose flood tides no moon can sway. Why did Mayes choose to write the essay in this style? Was she just pushing the edge of the envelope, experimenting, teasing the reader? Or did the memories flow so seamlessly that it would have interrupted her train of thought to break them up with periods? Is the reader so enthralled with the birthing of the essay (sorry I couldn’t help myself) that she would be disappointed for the interruption that a period would bring? Reading “Frankye’s Cookbooks” was an exercise in writing for me. I’ll be watching for those periods wherever my reading life leads me now. And wondering where to put the periods in my own work. I’ll be waiting for the right time to say goodbye to each phrase. Because periods really do signal an ending. I’ve wrestled with learning how to write (and to write copy) for the web. Long sentences please me as well; the semicolon is my favorite piece of punctuation. And yet – apparently this isn’t good for web content. I love how you pondered the connection with the South; now that I think of it, exploring writing styles of different regions of the country could be interesting. It’s probably been done, but it’s just now tickling my brain, so it feels new. In any case – intriguing! Thanks for reading and commenting, Pauline. Different regions definitely have different writing styles. I also write, and often speak, in long sentences, even though I am from the Northeast, not the South. Maybe that is why I didn’t enjoy studying Hemingway in high school; his prose always seemed so choppy to me. Because I read and write poetry, I think about punctuation in a more fluid way than I used to. It isn’t so much about grammar as about length of pauses or whether or not one wants to interrupt the flow of thought. I was interested to hear about the Mayes stream of consciousness essay with just a closing period, as it seems to mirror, in longer form, some poetry I have read. I use punctuation with much more fluidity in my poetry, occasionally writing with no punctuation, at all, but more often with lots of commas and dashes and a smaller amount of periods. Yes… and maybe Mayes’ essay could be considered lyric prose. Wish it was available for you to read online…. I think a lot has shifted, with regards to our potential readers’ lifestyles and literary sensibilities. The challenge comes of meeting them where they are, while also remaining true to our own voice and the story itself. 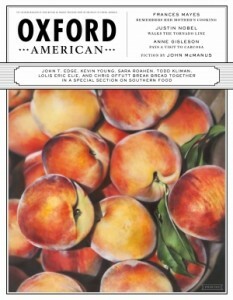 I ordered this issue of Oxford American. Looks like a great read! Let me know what you think after you read the essay. It wasn’t available online (only some of the OA’s content is). So enthralled was I by the imagery of what could have been my Great Aunt’s kitchen (de facto grandmother) in Mississippi, I never noticed the missing periods. The words spoke and, to me, the form is irrelevant. Glad the words spoke to you… but the form is anything but irrelevant to my readers who are also writers:-) My grandmothers both lived in Mississippi, too…one in Meridian and one in Jackson. Where are you from?